This Ableton Operator Dubstep preset pack is swanky, wanky, filthy and deep. 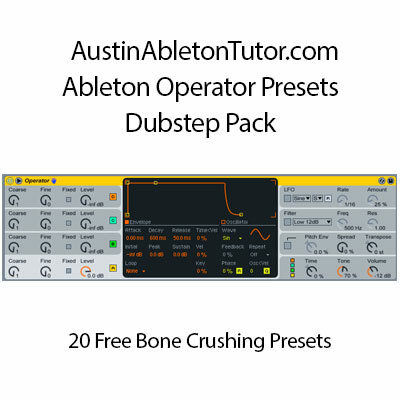 The Pack includes 20 nasty Dubstep presets using Ableton’s Operator for your tweaking pleasure. This Ableton Operator preset pack will work in Ableton Live 8 or newer. Be Sure to twist, turn and rotate to get some seriously deep and heavy sounds. Combine the preset pack with the Vowel Filters Pack. I will not be held responsible for the destruction that will ensue when you combine the Ableton Operator Dubstep preset pack with the Vowel Filters. Caspa, Zeds Dead, and Skrillex will even be scared when you start tweaking these presets. The Ableton Operator Dubstep preset pack is designed for extreme tweakabilty the 8 macro knobs are set up in a very intuitive and consistent way to encourage you to design your own sounds and add your own character. Check out The Untz List of the top ten greatest Dubstep Producers of all time for inspiration and then play with this Ableton Operator Dubstep Preset Pack and see what amazing Dubstep bangers you can come up with yourself. The presets are not for the faint at heart. My name is Jimmy Allison and I am An Ableton Certified Trainer and teach online classes and private lessons. Feel free to contact me with any questions.